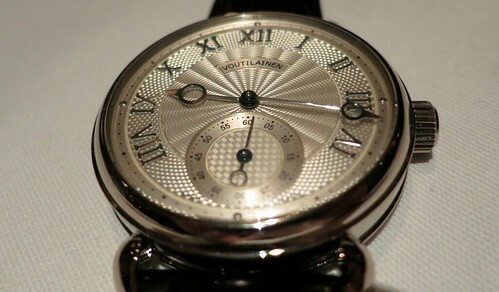 I was lucky** enough to be invited to a dinner with Kari Voutilainen last week. Kari had flownover to deliver one of his Vingt-8 pieces and very kindly agreed to let a few Purists (and me)join him for dinner. Dinner itself was in Galvin Bistrot de Luxe, a smart, bistrot moderne on Baker Street serving seasonally-led French food – a pretty good place to have a watch-focused dinner, as the waiters don’t seem to mind timepieces being strewn all over the crisp linen napery! In fact our server clocked the Jaeger LeCoultre Reverso Squadra on the wrist of one of my fellow diners immediately. A closet #watchnerd, perhaps? 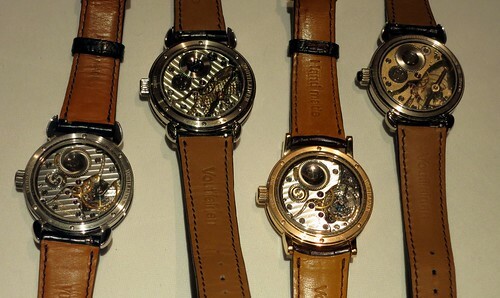 Kari is a member of the AHCI – the loosely-linked association of independent watchmakers that includes Peter Speake-Marin, Aniceto Jiménez Pita and the Habrings, as well as luminaries like Vianey Halter, Philippe Dufour, Christiaan Van der Klaaw, Felix Baumgartner and the late George Daniels. Kari’s watches range from the incredible (his Decimal Repeater pieces from the mid-2000s remain some of my all-time favourites) to the beautiful (Observatoire, anyone?) and utilise new-old technologies, such as the Grossman curve. 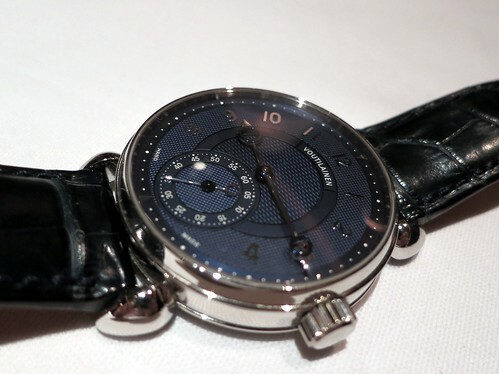 He has also found time to work with Maitres du Temps to produce the Chapter Three Reveal. The finishing / dial manufacture is superb on all his pieces, with guilloche effects, mother of pearl and even onyx adorning the dials and crowns, and it really is a pleasure to see them. The dinner itself was a lovely affair, and I spent some time talking to Kari about his love of marine chronometers and his views on the future of watchmaking. With four of Kari’s watches present, it was a fantastic opportunity to get close to these wonderful pieces and to see the subtle, but continuous changes to movements, finishes and designs that have taken place over the last few years. As always, I was the odd man out, as I’d limped out of the house with a vintage Baylor diver, rather than a horological masterpiece like the others – luckily, my fellow diners didn’t seem to mind! **I seem to be *amazingly* lucky to get invited to these things. Certainly, being a member of a few watch forums (most notably ATG Vintage Watches), building a number of relationships through Twitter, ocasional ‘blogging etc hasn’t hurt. What does amaze me though, is the incredible generosity that so many people in the watchmaking industry show to their clients, potential clients and other hangers-on (like me), and how generous and friendly so many members of Twitter, Purists and forums like ATG are. Hey ho.